Probably most people who speak of a conflict between science and religion, though, don't mean the "religion" of astrology -- if they think of astrology as a religion at all. They mean Christianity or perhaps Judeo-Christianity. They have before their minds Galileo and his struggle with the Inquisition of the Catholic Church over geocentrism or, more recently, the argument certain Christians have with the theory of evolution. Or perhaps they have only a vague idea that as science progresses religion becomes more and more problematic. Religion, in this view, is simply a way of talking about things science hasn't yet explained. When science gets around to explaining them, no role for religion will remain, and like the State in the Marxist paradise, it will wither away. Those ideas about science and "religion" suppose an inherent conflict between the two fields. Conflicts, of course, make for more exciting news stories. But does the constant "hook" of a battle between science and religion reflect reality? 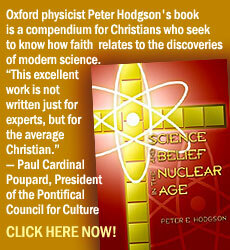 Are science and religion -- specifically Christianity -- inevitably at odds with one another? 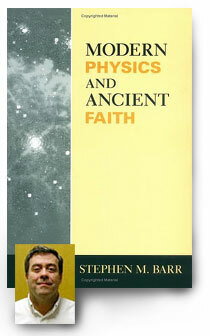 No, says physicist and Catholic Stephen Barr, author of Modern Physics and Ancient Faith (University of Notre Dame Press). Dr. Barr is professor of physics at the Bartol Research Institute at the University of Delaware. His writings include essays such as "A new Symmetry Breaking Pattern for SO(10) and Proton Decay" and "Electric Dipole Moment of the Electron and of the Neutron", though IgnatiusInsight.com readers are more likely to know Stephen Barr's essays and reviews in First Things magazine, where he writes on such topics as evolution and Intelligent Design and naturalism. Ignatius Insight recently interviewed Dr. Barr on science and religion. IgnatiusInsight.com: What is your background in science? In religion? IgnatiusInsight.com: The controversial issue of Intelligent Design involves a basic question: What is science? How would you define science, as opposed to philosophy and theology? And would you call the "design hypothesis" put forward by the Intelligent Design movement science? IgnatiusInsight.com: Some scientists write as if they think that science can answer any question capable of being asked and answered. How would you respond? IgnatiusInsight.com: What, in your view, is the most significant misunderstanding when it comes to religion and science? Dr. Barr: Many atheists believe that all religion is at bottom either a pre-scientific attempt to understand natural phenomena through myth or an attempt to obtain worldly benefits through magic. And since they see science as the antithesis of myth and magic they cannot help but see all religion as antiscientific. Of course, such people haven't a clue what true religion is all about. IgnatiusInsight.com: Do you know many scientists who are also religious believers? Dr. Barr: Yes, quite a few. Indeed, I have about half a dozen friends in my own field who are devout Catholics. In fact, one of the real geniuses in my field (he would be ranked at or near the very top) is a practicing Catholic. However, in my experience most scientists are non-religious. However, that may have more to do with general cultural attitudes than with them being scientists. I have found as much atheism in humanities departments as in science departments. IgnatiusInsight.com: The science/religion debate/discussion operates on a number of levels. One is on the cosmic level -- the existence of the universe. What can science tell us of the universe's origins? Are there limits to what science can say? What role do philosophy and theology play in considering the question of the universe's origin? As far as the beginning moments of the universe go, science may eventually be able to describe what happened then. That is, when we know the fundamental laws of physics in their entirety -- as I hope someday we will -- it may well turn out that the opening events of the universe happened in accordance with those laws. In that sense, "the beginning" could have been "natural". However, that would not explain the "origin" of the universe in the deeper sense meant by "Creation". Let me use an analogy. The first words of a play -- say Hamlet -- may obey the laws of English grammar. They may also fit into the rest of the plot in a natural way. In that sense, one might be able to give an "internal explanation" of those beginning words. However, that would not explain why there is a play. There is a play because there is a playwright. When we ask about the "origin" of the play, we are not asking about its first words, we are asking who wrote it and why. The origin of the universe is God Almighty. IgnatiusInsight.com: What do you think about efforts to develop a "Theory of Everything"? Dr. Barr: I prefer to speak about a "Theory of Everything Physical". The goal of fundamental physics is to find the ultimate laws that govern all of physical reality. Most physicists, myself included, are convinced that such ultimate laws exist. There are good reasons to suspect that "superstring theory" -- or what is now called "M-theory" -- may be that ultimate theory. However, we are very far from being able to test it. In any event, to call any physics theory a "Theory of Everything" is to make the unwarranted -- indeed false -- assumption that everything is physical. IgnatiusInsight.com: What about the idea of multiple universes? Can we speak meaningfully of more than one "universe"? Dr. Barr: As most people use the phrase, "multiple universes" is really a misnomer. What they usually really mean is that there is just one universe that is made up of many "domains" or regions, which are mutually inaccessible in practice -- for example, because they are too far apart. The physical conditions in the various domains could be so different that they would appear superficially to have different physical laws. However, in all such scenarios it is assumed that the various domains actually all obey the same fundamental or ultimate laws. This "multiverse" idea is a perfectly sensible one. In fact, there are reasons to suspect that our universe may have such a domain structure. IgnatiusInsight.com: Stephen Hawking, in A Brief History of Time, talks about God and the mind of God. Yet he also seems to question whether there really is the need for a Creator in order to explain the existence of the cosmos. How do you see the matter? Is God a "necessary hypothesis"? Does science have anything to say about the question? I think scientists like Hawking would be helped if they could imagine God as an infinite Mind that understands and knows all things and Who, indeed, "thought the world up". If all of reality is "intelligible" (an idea that would appeal to scientists), then it follows really that there is some Intellect capable of understanding it fully. If no such Intellect exists or could exist, in what sense is reality fully intelligible? We need to recover the idea of God as the Logos, i.e. God as Reason itself. I note that Pope Benedict has stressed this in his recent addresses about science and in his speech at Regensburg. It is an idea of God that people who devote their lives to rational inquiry can appreciate. IgnatiusInsight.com: You've written about the creation/evolution/ intelligent design controversy. What is your understanding of the main issues in that debate? Where do you come down? The Creationists deny that evolution happened. They are charging off an intellectual cliff. There is overwhelming and convergent evidence from many directions for the evolution of species. So it is embarrassing that this "Creationism" versus Evolution battle is still going on. Fortunately, it has never been a Catholic fight. The Catholic Church has never had an objection to the idea of the evolution of species of plants and animals. As far as the evolution of man goes, the Church has always insisted that the human soul, being spiritual, cannot be explained by, or be the product of, merely material processes, whether biological reproduction or biological evolution. The soul of each human being is directly conferred on him or her by God, as taught symbolically in Gen 2:7. However, the Church never condemned the idea that the human body evolved from pre-existing organisms. The natural origin of the human body by evolution is no more a threat to anything we believe as Catholics than is the natural origin of each human body by sexual reproduction. Frankly, I don't see this debate as one in which Catholics, as Catholics, have any stake. The traditional arguments for the existence of God are much deeper and more reliable than the ones the ID movement is trying to make. The Catholic Church herself has taken no stance on this controversy. A 2004 document of the International Theological Commission, Communion and Stewardship, issued with the approval of then Cardinal Ratzinger, said it was an interesting dispute that should be left to scientists to decide, since it could not be decided by theological arguments. IgnatiusInsight.com: Critics of evolution point to statements made by some evolutionists to the effect that life emerged by chance occurrences or "random mutations" and natural selection. The "randomness" thought to be involved critics take as undercutting a claim that life on earth is the result of the creative act of God. What is your view of the matter? Dr. Barr: The idea that chance plays a role in events is in no way contrary to Catholic doctrine. St. Augustine in The City of God says that no one in this life "can escape being tossed about by chance and accident". St. Thomas Aquinas devoted a whole chapter of his Summa Contra Gentiles (Book 3 chapter 74) to defending the proposition that "Divine Providence does not exclude chance and accident." The Bible itself talks about chance: "Time and chance happeneth to them all" (Ecclesiastes 9:11). IgnatiusInsight.com: The SETI project seems predicated on the likelihood of extraterrestrial life. Do we have good scientific grounds for thinking such life exists? Would the existence of extraterrestrial life pose any special problems, in your view, to religion in general or Christianity in particular? I don't see why extraterrestrial life raises any problems at all for Catholic theology. God might have created free and rational beings in other parts of the universe. If so, they would have immortal souls. If they fell, Christ could have redeemed them. He could have redeemed them in the same way He redeemed us. If the Second Person of the Blessed Trinity can assume unto Himself a human nature, He can assume unto himself the nature of another kind of rational creature as well. In the Hypostatic Union there is no "confusion of natures". They are not "blended". The divine and human nature, while they belong to the same Person, are distinct (though not separate). So we believe, unless we are Monothelite heretics. So, I can see no logical reason why the Second Person of the Trinity could not assume and act through any number of distinct finite natures that He makes his own. There could be more than one Incarnation, different ones for different rational species. Each Incarnation would give rise a distinct "Mystical Body of Christ". We redeemed humans would be members of His human Mystical Body, in which we would have communion with God and with each other. And the alien species (those who were redeemed) would be members of a different Mystical Body, in which they would have communion with God and with each other. These are my own views, and I speak under correction. However, this question is purely speculative, as it is highly unlikely we will ever know whether other rational beings exist in this universe. IgnatiusInsight.com: You've written about the issue of artificial intelligence. Many scientists and technicians seem to think it only a matter of time before a genuinely artificial intelligence, capable of engaging in all the kinds of intellectual activities of human beings is created. What is your view? Dr. Barr: I haven't followed her writings, but I know that there are many people who would argue that "spirit" is an "emergent" property of matter. I look askance at such theories. As far as I am concerned, to say that the spiritual is "physical" is reductive. "Non-reductive physicalism" sounds to me like a contradiction in terms. While the spiritual can be incarnate in matter, it cannot emerge from matter. The spiritual powers of man, i.e. his intellect and will, cannot be explained as growing out of the natural potentialities of matter, in my view. As I argue in my book, matter cannot understand and the merely physical cannot have freedom. I think the late pope was saying the same thing when he said that between man and the lower animals there is an "ontological discontinuity". And I think that Pope Pius XII was saying the same thing when he insisted that the human spiritual soul cannot have evolved by material processes. And I think that Genesis 2:7 is saying the same thing in speaking of God "breathing" the soul into Adam. There are a lot of people nowadays who are made uncomfortable by the idea of a human "spiritual soul". I am not one of them. I am happy to see that we in English-speaking countries shall once more say at Mass "and with your SPIRIT" and in the Domine non sum dignus "only say the word and my SOUL shall be healed". There has been too much embarrassment over the idea of the soul. 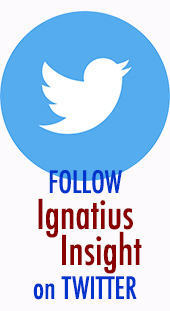 IgnatiusInsight.com: Many scientists are outspoken when it comes to social issues. Does science, qua science, provide objective values and an ethical code that is in principle universal? Or do scientists get their ethical principles elsewhere, like the rest of us? IgnatiusInsight.com: Obviously, such things are beyond the power of strict prediction, but do you think it likely that we will see another Copernican revolution in thought that affects our worldview, including our theological worldview? If so, in what area of science do you think it likely this will occur? that is what my book Modern Physics and Ancient Faith, is all about.  Order Modern Physics and Ancient Faith through Amazon.com or The University of Notre Dame Press. Do you have comments or questions about this article? Share them on the Insight Scoop blog.  The Evidential Power of Beauty | Fr. Thomas Dubay, S.M. Mark Brumley is President of Ignatius Press and associate publisher of IgnatiusInsight.com. An former staff apologist with Catholic Answers, Mark is the author of How Not To Share Your Faith (Catholic Answers) and contributor to The Five Issues That Matter Most. He is a regular contributor to the InsightScoop web log. He has written articles for numerous periodicals and has appeared on FOX NEWS, ABC NEWS, EWTN, PBS's NewsHour, and other television and radio programs.